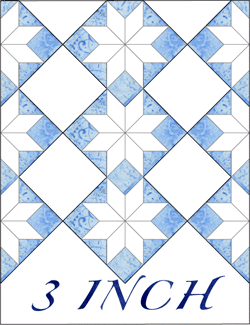 This Inklingo PDF includes 45° Diamonds, Quarter Square Triangles (QST), Half Square Triangles (HST), and Squares. These shapes are the perfect size for 3 inch LeMoyne Star blocks. Bonus Shapes make this collection even more versatile. You have a choice of sizes including the 4.5 inch star in the FREE Diamond Triangle Square shape collection. These are just a few of the extra blocks using these shapes. The shapes are a perfect introduction for beginners. Make 9-patches, Sawtooth Squares, Hour Glass, and other blocks with these shapes if you aren't ready for an 8-pointed star. Everything is easier with Inklingo—no measuring, no templates, no worries about straight grain, a line to cut on, a line to sew on—and there are detailed instructions for sewing and pressing on the All About Inklingo blog, so jump in! It's fun! The shapes are smaller than the ones in the free Inklingo Shape Collection, but the ideas and worksheets in that downloadable shape collection are perfect for this too. My Mistake! I probably shouldn't have named this collection "LeMoyne Star" because that is just the tip of the iceberg. Please don't limit yourself to a few stars. 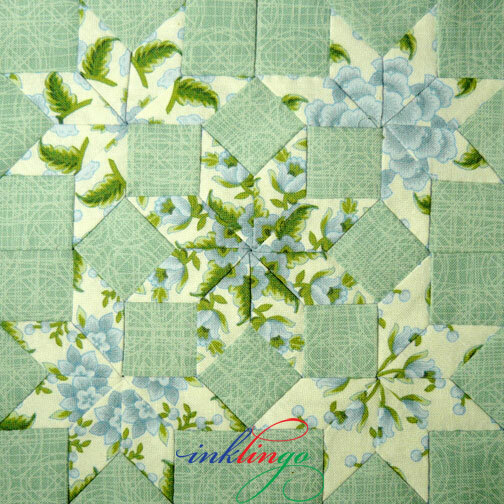 Please see the All About Inklingo blog for lessons about "No Waste Fussy Cutting" and how to sew and press LeMoyne Stars by hand and by machine. In 2014, I published an article with a one-page guide on the blog showing the simplest way to sew LeMoyne Star by machine.